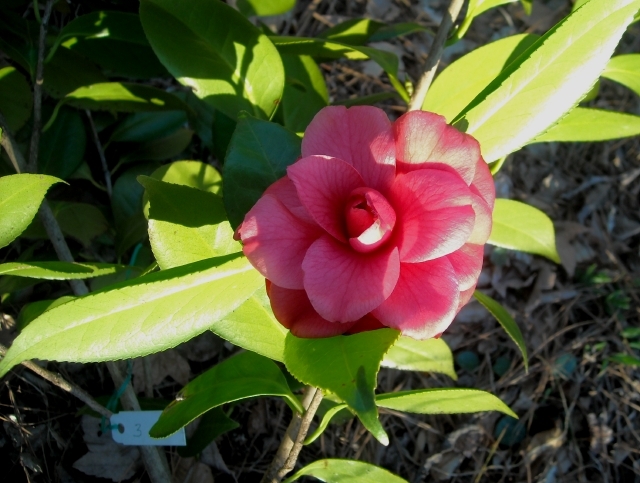 Oriental gardeners have been propagating camellias by a technique called air layering since ancient times. For us, this is truly a mystifying process. During spring 2010 we put almost 100 air layers on about 20 aged but neglected heirloom plants growing in the garden around our daughter’s newly purchased home in Atlanta. What satisfaction to remove air layers the following fall and find bundles of fine white roots that held the promise of new life. We attributed such grand success to the health of these old plants that had not been coddled in years but were growing in good soil and ideal conditions. 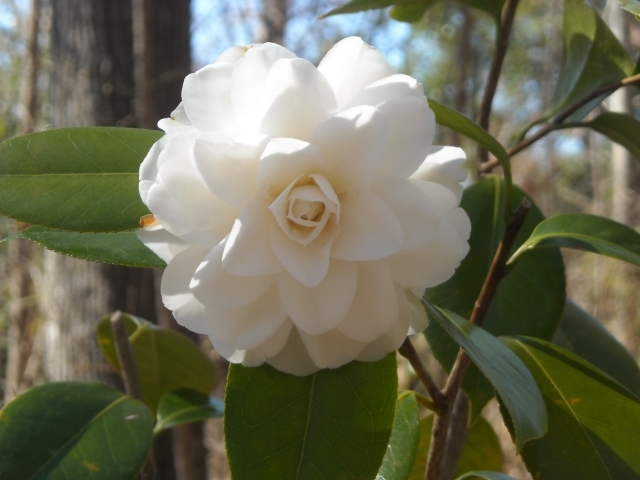 Several years ago we learned the techniques of air layering at the Norfolk Botanical Garden during workshops held by the Virginia Camellia Society. We volunteered there for many years, air layering branches of old heirloom plants in spring and removing the air layers for potting in fall. The Society would then sell the new plants to support Garden operations. We’ve also been invited into gardens of friends to air layer plants we liked. 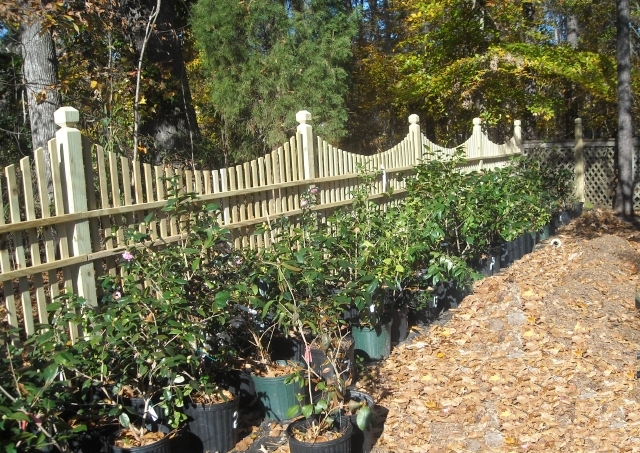 Generously, our friends allowed us to plant these new (to us) camellias in our garden. Rarely did we know the names of either these or the Atlanta plants, but it didn’t matter. They have become success stories in our garden. 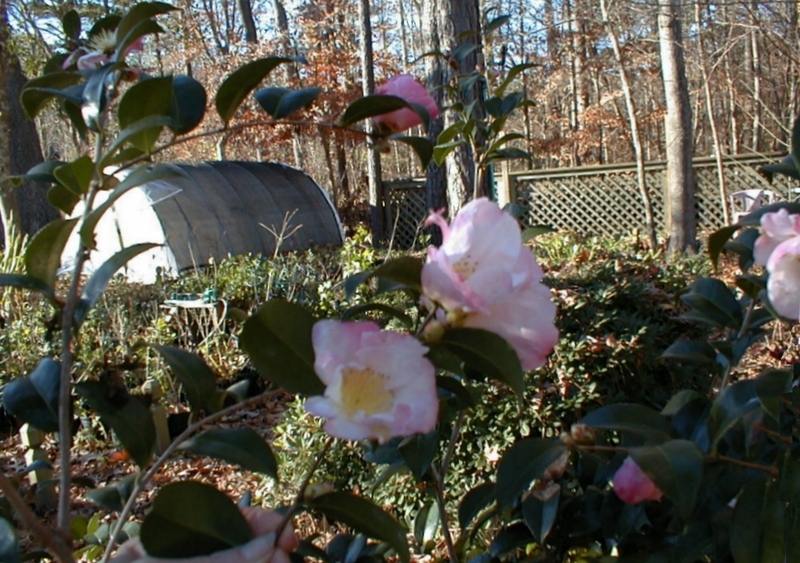 During mid-spring, after most camellias have finished blooming and energy is going into new growth, we choose a healthy branch that’s growing upright on a healthy plant. Good health is key. You cannot purchase life insurance on a spindly, half-dead camellia by air layering a branch and expect a lovely new plant. It rarely works. We know. We’ve tried it. Previously pruned branches and side branches do not usually make attractive air layers. Vertical branches are best. The branch should be at least the diameter of your pinky finger or greater and anywhere from a foot to about two and a half feet. There are bound to be some failures, so we usually air layer three or four branches on a plant. We’ve noticed that air layers on branches in strong sun seem to be less successful than those in shade or part shade. Gardener’s aside: This exercise of examining branches forces you to look closely at the plant from all angles. You begin to take note of its over-all health, the presence of insects, and the need for pruning. 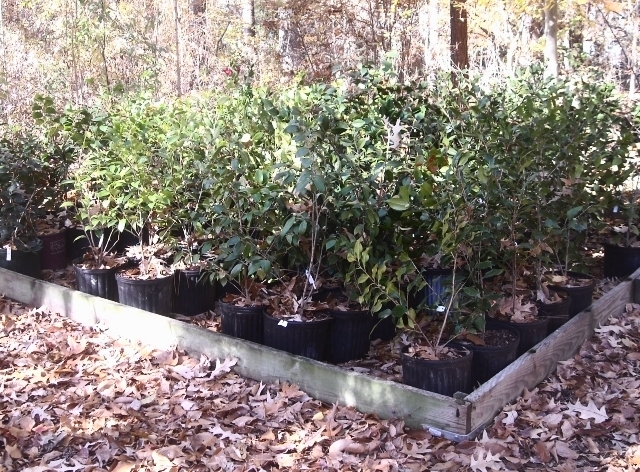 Air layering can be a good time to reduce the size of your plant or prune it to shape. And, incidentally, this activity has contributed to our powers of observation as gardeners. 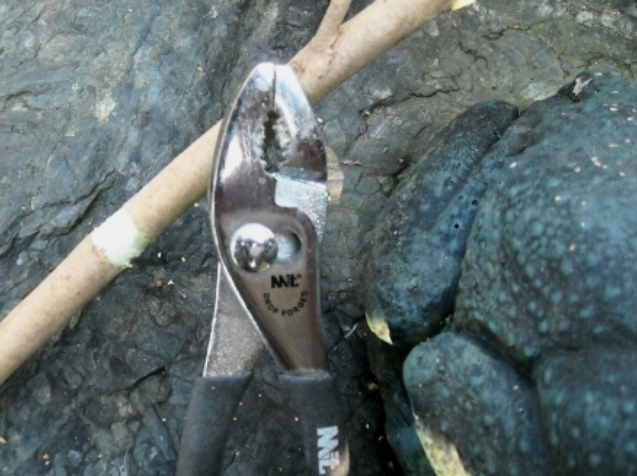 To continue: Using an inexpensive pair of pliers with sharp teeth, we grip the branch and rotate the pliers around to scrape off about an inch or so of bark all around the branch. Diligence in scraping is critical to promoting root growth. No green tissue should remain. If so, the air layer will not take. Only white wood should show in the scraped area. Do not become so enthusiastic about removing material that you lacerate or crush the branch. 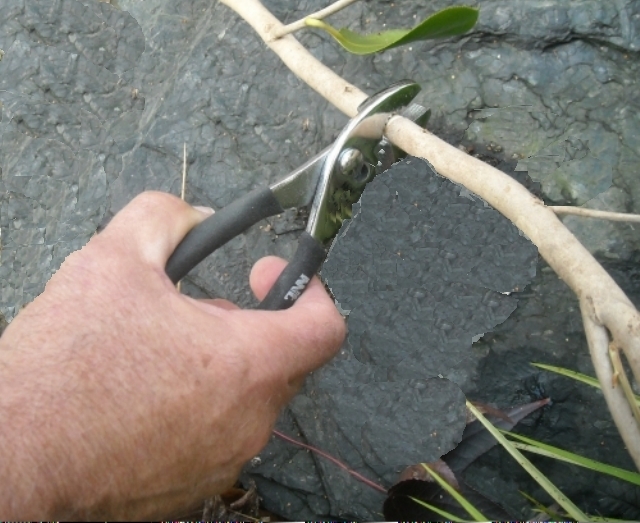 Instead of pliers, you can use a sharp knife to scrape away the bark, but this is more time-consuming and probably not as safe as scraping with pliers. Prior to preparing the air layers, we soak long-strand sphagnum moss in water for a few hours, over night is fine, until it is fully saturated. You can order long-strand sphagnum moss on line, but not in small quantities. Splitting purchases with like-minded friends can save money. Alternatively, some people have had success purchasing small quantities of the sphagnum moss you can find in local nurseries. We scoop up a generous handful of sphagnum and wring it out very well. No dripping, the drier the better. We wrap it around the wound and then wrap the bundle with a piece of 10 x 10 inch heavy-duty aluminum foil or, preferably green florists’ foil. Florists’ foil is more durable than aluminum foil and its subtle color allows air layers to blend into surrounding foliage. I am not a fan of glitzy aluminum-foil garden art. Double-wrapping aluminum foil will provide an extra barrier against pecking and poking by birds and animals curious about the shiny package. If using aluminum foil, check periodically for tampering. Be sure the bundle is wrapped tightly at the top and left slightly loose at the bottom. This will prevent rain water from entering and allow any that does to drain away. Air layering is more successful if the sphagnum remains only slightly moist. If it is too wet, little or no root growth will occur. 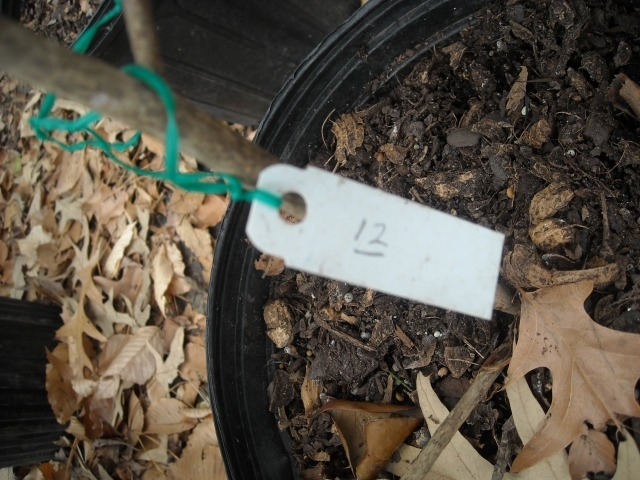 To keep track of our air layers, we make a label by punching a hole in a plant tag or cut-down venetian blind slat and tie it to the air-layered branch above the bundle. 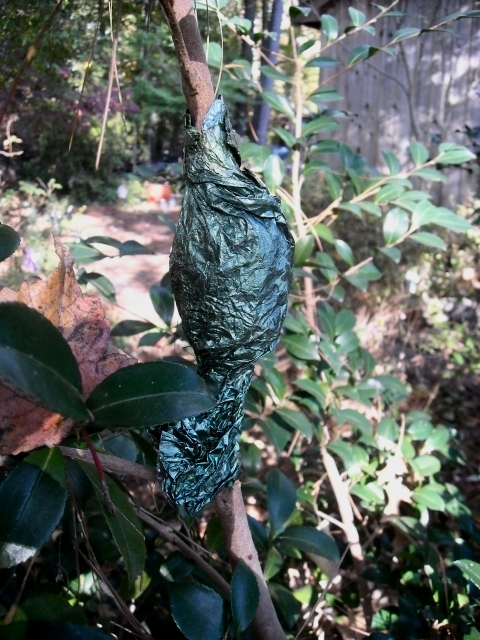 Some people affix the tie at the top of the foil bundle as added insurance to keeping rain out, but the tie will have to be removed during harvest and replaced directly onto the air-layered branch. A Number 2 pencil to write names and dates on tags works best for durability and legibility. Even Sharpie markers fade. Plastic labels will usually last a few years before they disintegrate. If you don’t know the name, make up one or use a numbering system. 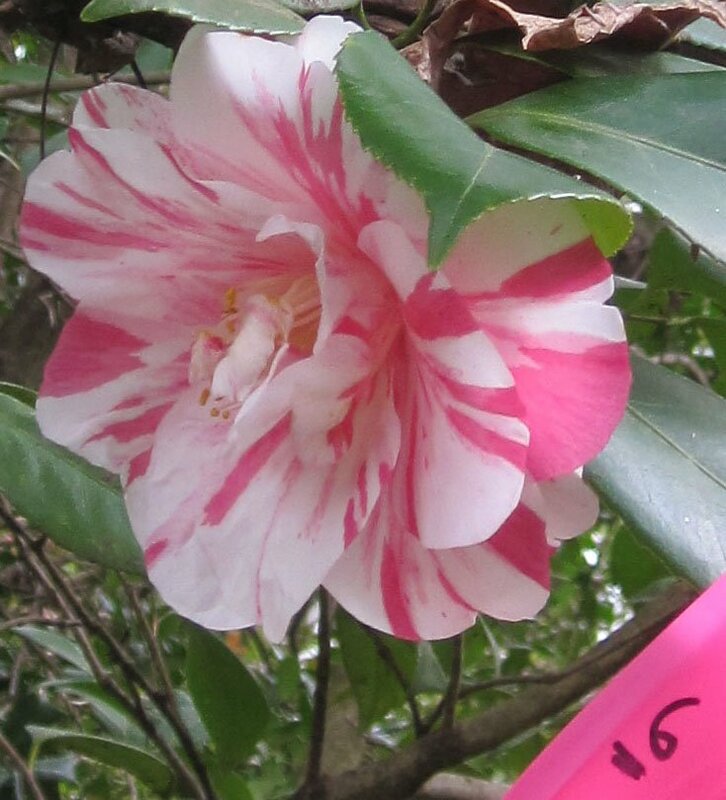 We handled so many unknown camellias in Atlanta we gave each species a number and recorded the number of air layers put on each plant. 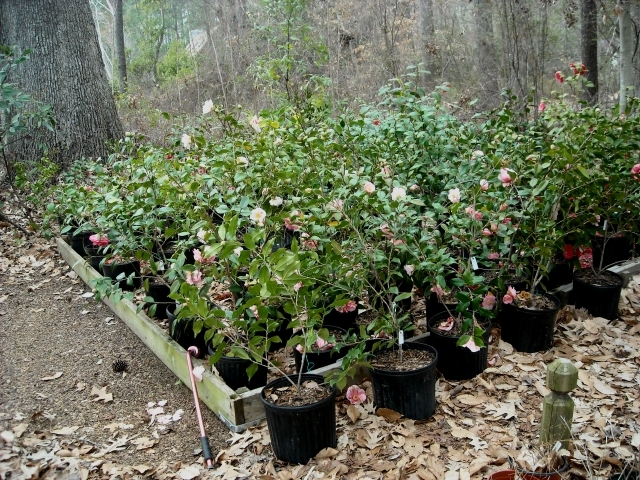 Except for the Atlanta camellias, whose numbers were overwhelming, we never seemed to get to that record-keeping step. We trust to memory that can falter.When we use green florist’s foil, which is practically invisible among leaves and branches, we occasionally forget to harvest a new plant. Sometimes it matters; usually it does not. Until fall, we ignore the air layers. They don’t need any watering or care. If we happen to remember them some time in August, we might check to be sure the package is still in tact and wrapped tightly. This relaxed attitude is quite different from the days when we were anxious, novice camellia propagators.We would look for progress too soon, too often, tentatively peaking and then carefully setting the unwrapped bundle to rights. Before we remove an air layer from the mother plant, we check for roots in September or October. We fold back the foil as neatly as possible. 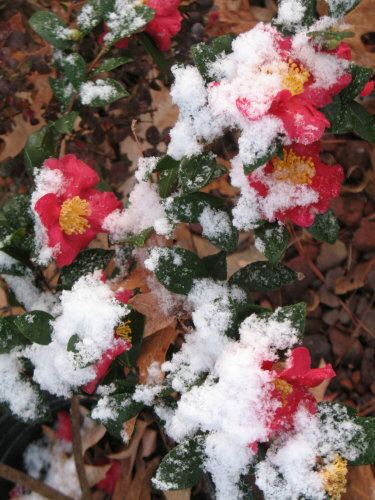 If the branch has been slow to root, the bundle can be resealed and left on the plant, though once winter sets in and plants become dormant, little or no additional root growth will occur. A healthy air layer should have a bundle of strong white roots. Often the ball is so dry we are amazed that roots can be alive. Yet it is these dry root balls that are often thickest with firm roots. Sometimes there is only a callous, a hard swelling where the bark was removed, with perhaps a hint of white root growth. We who are softies mark the tag with a question mark and go ahead and pot it up. Efficient growers would toss such a waif. Survival rates in these cases are low. When we cut off the air layer, we cut close to the trunk of the mother plant. We prune so no stub is left that could invite disease to enter the plant. This often leaves a long stem protruding from the bottom of the root ball. You can cut this off below the root ball if you wish. Some growers leave a short length of stem to help stabilize the plant in the pot. Others say this will promote rot. We have done both, and we can’t tell any difference in survival rates. Once the foil is removed, we do not touch the sphagnum, as the white roots are easily broken. 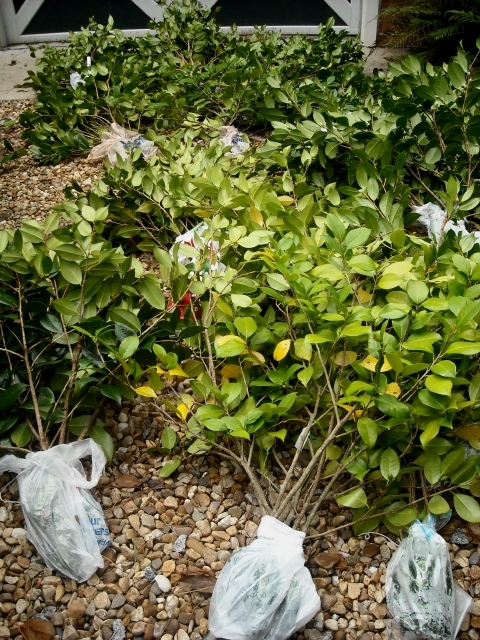 We soak the air layers in a pail of water for at least half an hour and do minimal pruning to shape or remove unwanted branches. New air layers are not likely to survive if they are planted directly in the ground. They should start their independent lives in pots. To avoid the step of “potting up” from smaller to larger pots, we plant directly in three-gallon pots, using coarse potting soil, mostly composted ground pine bark that will retain some moisture but not enough to cause root rot. We want to maintain a balance between water and air in the growing medium to let roots grow and “breathe.” If composted pine bark is not available, coarse perlite can be added to potting soil. Do not substitute pine-bark mulch unless you shred it. It is too dense and will not hold enough water. 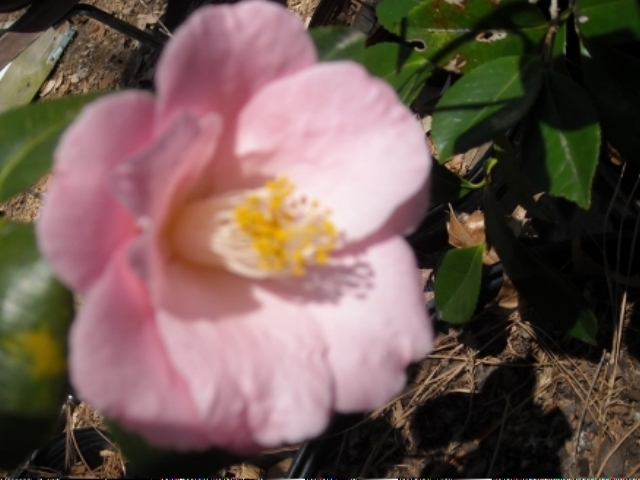 Though mature camellias prefer acid soil, young plants grow best in soil with a balanced pH of about 6.5 to 7. We are very careful when we handle the newly potted plants. 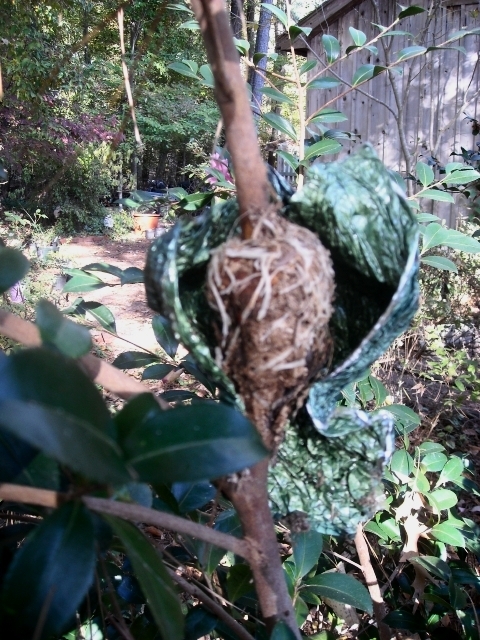 Air layers are unstable in the pot and a fragile ball of roots can be easily damaged. Good news, this condition does not last long. The roots of a healthy air layer, once settled, will race to the edge of the pot during the warm days of autumn. Fertilizing with a slow release fertilizer, 14 14 14, about a tablespoon of granules to each pot, helps roots take off. Immediately after potting we water plants thoroughly, so they are dripping. From this point on, watering is done as needed, a good drenching followed by a period of draining and drying. Happily, watering schedules in cool fall weather are more relaxed than in the heat of summer. 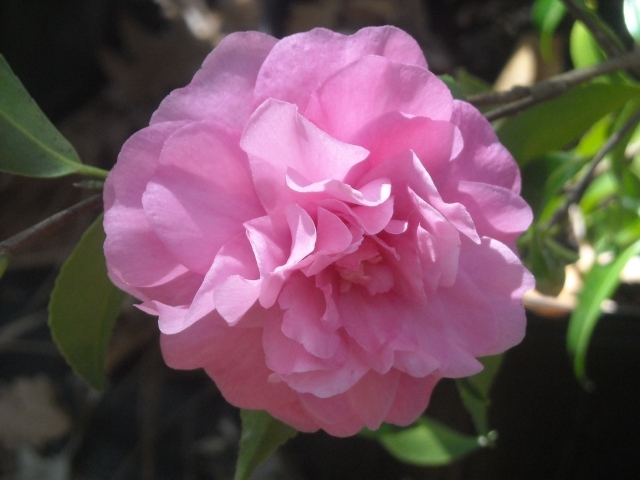 An aged camellia is drought tolerant to the point of independence from the gardener. 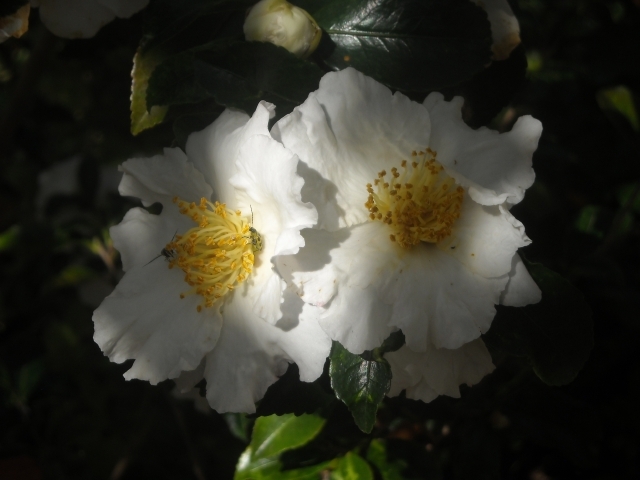 Young camellias don’t need to be fussed over either, but after all this work, we certainly do not ignore them. We use the finger-poked-down-the-side-of-the-pot technique to judge moisture. If soil is cool and moist, we delay watering. If we are leaving town for a week we water well, confident that the plant will survive our absence. Our winters are fairly mild, so new plants go to the lee of the garden, a fenced-in spot protected from intense sunshine and wind. From here on, they weather the elements on their own with a gentle mulching by falling autumn leaves. Pots set out in dappled shade will grow roots on the sunny side of the pot. In spring we check plants randomly for root growth by deftly overturning a few and instantly re-righting them. Roots have usually grown out to the sides of the pot but there is still loose soil. We give them another dose of time-release 14-14-14, a tablespoon of granules in each pot, and hold them in a shady area during summer. Some people choose to plant the youngsters directly in the ground, but we have summers that require a gardener’s vigilance. If young plants stay in pots until fall they will not have to struggle with less-than-ideal soil and drainage or compete with the roots of mature plants. Even after remaining in their pots for an entire year, they are still only toddlers with a long time ahead before they grow into handsome, high-stepping performers. Great article with appropriate pictures. Glad you found the pix and article helpful. I’m so glad you found some good information here. Sorry for the delay in answering but somehow your comment escaped me. Our daughter and son-in-law air layered japanese maples. They wanted to keep them low, so chose tall, upward growing branches. And they were successful, so go for it. And yes, it’s true about pruning camellias — first that it’s hard to stop once you start, and second, doing it “so a bird can fly through it.” Still, I can’t bear cutting that much away, except for limbing up. Thanks for sharing your thoughts. Great article I like the plier idea. I have layered about 50 this summer from my late fathers heirloom plants. He had about 30 varieties of japonicas and won various awards at shows in the ’60’s. 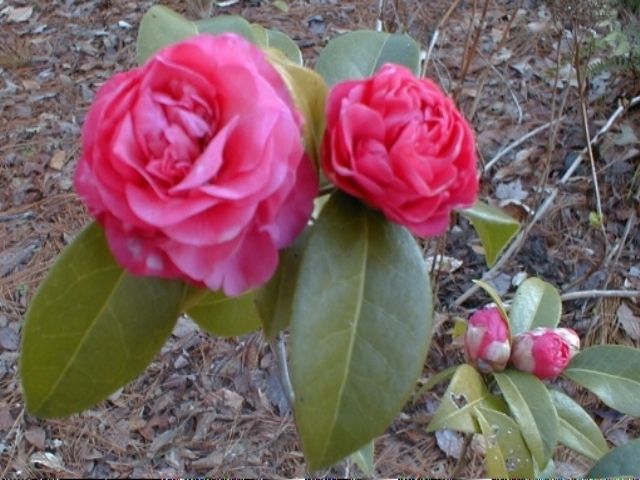 Katrina devastated the property, but has been cleaned and the surviving camellias are thriving. High praise from you, Chris, so experienced in air layering! I’m glad you liked our article and enjoyed hearing about your father’s heirloom plants. They are hard to find in nurseries sometimes. Good luck with the newbies. I’m sorry to hear about the devastation from Katrina–we saw it in Mississippi and were so affected by what we saw that we tried to spread the word through our blog.